Setting goals is the best way to propel your business forward in a meaningful way. For busy entrepreneurs, goal-setting is crucial. When your days are stretched thin, having a clear picture of what you are working towards makes all of the difference. In fact, every professional can benefit from clear expectations and transparency. We thrive on information and on knowing what is expected of us. 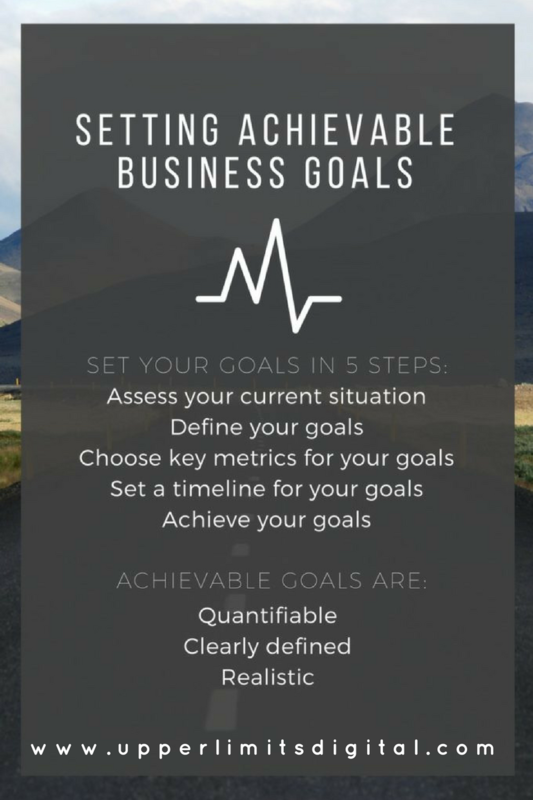 Setting achievable goals is a way to bring this transparency and clarity into your business for real results. Creating business goals is important because it helps you stay on track when things are chaotic. When you are in the middle of business “to-do” overload, achievable goals are the difference between helplessness and productivity. As a digital content strategist, goals give me a roadmap for content creation. If I know that our client wants to increase awareness of a new service, then I can use their content to drive this visibility. When you have a goal in mind, you have something to work towards. So how should you go about setting your business goals? The first step in setting business goals for the future is to know where you are currently. Spend time looking over your books and reflecting on the past year. What went well? What needs improving? Are you happy with your revenue stream or are you barely breaking even? It is important to be brutally honest about your business and to take your emotions out of it (as much as possible!). From here, determine which areas of your business you want to focus your energy on improving. These areas are built around themes like giving back to your community, business revenue and profit, growth either through additional personnel or new locations, and customer service. Before you can define your goals, you need to define the areas of your business where you want to see improvement. There are two types of goals to set for your business: long term and short term. The first step is to get a clear picture of where you want to be in the next 5/10 years. Then, break up these larger goals into smaller “stepping stone” goals. For example, pretend you want to grow your online sales by 400% over 5 years. This is a great goal, but it is big and unwieldy. You can and should break this down into annual, monthly, and weekly “bite-size” goals. When you are in the middle of business “to-do” overload, achievable goals are the difference between helplessness and productivity. What needs to happen for your online sales to increase? You need to increase your website traffic and convert visitors into online sales. These are two slightly smaller goals: (1) increase website traffic and (2) convert visitors. From here, you can break it down even further. To increase website traffic, you can (1) run a paid search campaign, (2) expand your reach on social media, (3) increase organic search power, and (4) run an online advertising campaign. When you define your goals, be sure to make them quantifiable, clear, and realistic. In other words, your goals need to be achievable. To achieve your goals, you need a timeline and a way to measure your success. You might think that just setting goals is enough to move the dial on your business… but most goals fail without a deadline and timely reporting on key metrics. In order to make your goals achievable, you need to get specific. First, when do you want to reach your goal? Your long term goals will have a – you guessed it – longer timeline. These will be the frame of your goal map and you should keep your longterm goals front and center. They will help ground your efforts and inspire you when you are battling the feeling of overwhelm. For your short term goals, break them down by quarter and then month. Once you have a clear timeline, it is time to figure out how you will monitor your goal progress. Metrics vary by platform, so each goal will have its own unique method of measurement. For our example goal of increasing online sales, let’s focus on the sub goal of driving website traffic. Specifically, let’s look at measuring the impact of your social media efforts on your website traffic. For your social media efforts, you will want to measure the number of visitors landing on your website from social media. I recommend using Google Analytics to track your website-specific goals. In fact, Analytics lets you set “Goals” and helps you track conversion rates. This lets you drill down even further and see the number of online sales that can be traced to your social media presence. You can even compare time periods for a clear picture of your progress. Making your goals time-specific and measuring them weekly will keep you on track. Of course, we are all human, and there will be off weeks. Have no fear. Track your progress, both negative and positive, and focus on making progress over time. We keep tracking spreadsheets for all of our clients. This keeps us organized and allows us to easily share results. If progress slows for a 7-day period, we always check it against a longer time frame. Is our overall momentum going upward? One week of less than stellar results does not make or break your goal progress. In fact, we find that a slow week provides amazing motivation and we always surpass the goal in the long run. Ahh, our collective favorite step in the goal-setting process: achieving your goals. Reaching your goal finish line is oh so sweet! It is not, however, an excuse to halt your efforts. Once you achieve your goals, it is time to set your next batch of achievable goals. Using this process as your guide, you are armed and ready to conquer the next, even higher mountain. Are you still struggling to gain clarity around your business goals? Sign-up for a 60 minute strategy session today. Our strategy sessions can be arranged in person, over the phone, or via video. We know your time is valuable and we will never waste it!